To purchase a powerful anti-GPS tracking jammer, choose a professional online jammers store - jammer-buy.com.We are professional manufacturer and seller of jammers, we have advanced manufacturing technology and the highest quality products. GPS trackers are commonly used worldwide for vehicle tracking and personal tracking.GPS technology has a wide range of use cases,can provide convenience for our life,but also may bring us hidden threats. Are you still worried about your trip being tracked by illegal molecules? Buying a handheld anti tracking jammers can help you get out of the track. Anti car gps jammer is one of the most popular jamming devices on the market.The classified satellite signal jammers device can block all tracking. In addition, a technology called A-GPS combines GPS with a smartphone navigation system as an important tracking medium.To deal with the tracking,we provide you the multifunction satellite tracking cell phone signal blocking GSM Jammers. This 5 bands black shell portable gps signal blocker has three anti satellite tracking signal combinations for your choice, excellent texture. Radius of jamming can be up 20 meters. It is one of the most popular jammers in the jamming market today. 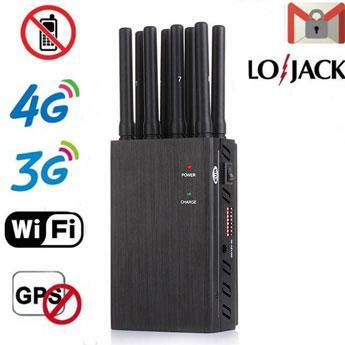 2019 new 8 bands portable GPS jammer, can shield 2G 3G 4G WiFi Lojack signal, powerful power and interference range, the maximum interference radius is up to 25 meters. Handheld pocket jammer jamming GSM+3G, GPS, WiFi signal types depends on your choice.Easy to hide and use,the maximum jamming radius up 10 meters, removable battery, delivery car charger, so you can use it anywhere that you want to jamming the signal. The handheld signal blocker can jam GSM GPS 3G signal at the same time. Car charger provide for you convenient use anywhere in the vehicle.Up 15 meters radius is enough to keep your privacy safe. This portable jammer is very popular nowadays. Jamming with GSM 3G , GPS, WiFi . It has the characteristics of light weight and small volume. Interfere radius up 15 meters. 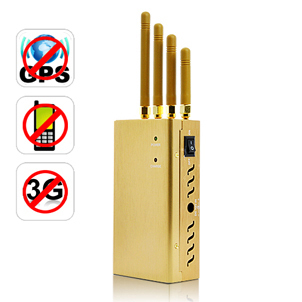 This gsm signal blocker interfere with GSM 3G GPS WiFi 315 433 868 depends on your needs, small and portable features. Maximum jamming radius of 15 meters,car charger is standard. 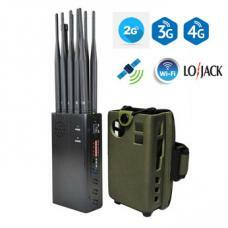 Handheld mobile jammer can block GSM 3G mobile cellular signal, remote control frequency 433MHz 315MHz 868MHz , WiFi and GPS.The black shell and portable design make it easy to hidden and use.The maximum jamming distance up 15 meters,best tool for you to protect privacy. 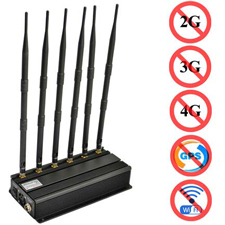 This desktop pwoerful jammer with 8 antennas can jamming cellular signal GSM/3G/4G and WiFi Lojack GPS tracking frequency, built in two cooling fans to ensure good heat dissipation for work, desktop multi-antenna design makes it jamming radius up to 30 meters.It is powerful enough and very popular in the world. The latest powerful desktop signal jamming device is equipped with 8 antennas that can interfere with 4G, 3G, 2G, WiFi and GPS frequencies with a maximum effective jamming radius of 40 meters. The handheld anti tracking jamming device can block satellite tracker. Easy carry and use for your car, 2 bands portable jammer and it has a very wide range of interference radius up to 15 meters.It is a movement protection device that is favored by the driver. This mini lightweight gps signal blockers for car is most popular on the market and sale cheaper,block car satellite tracking frequency,for vehicle cigarette lighter can work long hours without being limited by batteries, jamming radius up 15 meters. Handheld gps satellite signal jammer compact and lightweight and car charger makes it easy for you to use anywhere.,distribute car charger. It is an artifact of anti-tracking by car drivers and the maximum jamming radius is 15 meters depends on your area. This U disk design gps signal jammer for anti satellite tracking, mini shape make it easy carry and hidden, usb port design can be used directly for your phone, computer and car. For such a small shape, the 5 meter interference radius is the most powerful. The homemade GPS jammer system prevents satellite receivers from interfering and deliberately interfering. Using anti tracked jamming function is minimized to reduce the interference power, make satellite signal jammers can continue to work normally. What are the characteristics of the car GPS jammers device? - Has a car charger, can provide longer working hours for the car. - Portability, simple, and easily hidden features. - It takes a long time to work and it is inseparable from the good heat dissipation performance, so it should also have a very good cooling system. - The most important point is to have a small shape but powerful, wide enough interference radius, and more effective against you. Recently, news reports about the state of the global positioning system will be enforced on public service vehicles, can let the relevant departments can be real-time monitoring of the vehicle. The installation of gps can provide accurate information feedback for the safety of cars and passengers,but it would violate their privacy. Therefore, many people buy anti gps tracking jammers devices for privacy protection. If you find yourself being tracked, you can use the car GPS blocker to make the satellite positioning device inoperable and avoid car satellite signal tracking. This is one of the reasons why GPS jammer are so popular. The gps signal jamming device can interfere with the tracker of criminals, and even prohibit the positioning of vehicles by satellites. The use of jammers can prevent terrorists from tracking us, making it impossible for criminals to accurately pose a threat to our whereabouts.If you're worried that your car is being tracked by a lawless molecule, you can buy a satellite signal scrambler, which will protect your whereabouts and keep you from being monitored. If you're worried about your phone becoming your tracker, you can use the cell phone USB GPS blocker, which can put you in a safe position. > Why are these global position system jammers so popular? > Is it safe to remove satellite positioning system from your car? As you probably already know, now the satellite signal tracking may be useful to your location, not only will invade your privacy, because the law enforcement agencies in different countries will be the location of the relevant action authorization. They will within a tracking device on your vehicle, it can help them to know that any of your information, real-time and monitor your position at will, because these countries/regions of privacy law is not complete. In order to help you cope with such things, it is necessary to take appropriate protective measures, so you must use GPS jammer. These devices can prevent any country's satellite tracking system from knowing where you are. The only exception is the iridium satellite network, but we have a special device. In addition to GPS trackers, there are devices that can be used to help you get tracked: your car or your smartphone. Generally, all modern smartphones have built-in GPS chip modules. This module allows law enforcement agencies or the communication operators access to your location based data information, at the same time can also be in the absence of authorization, government employees can track all your actions, track your vehicle. It can perform the same function as a tracking device. But, you also need not worry too much, you order in our store to buy our tracking products, it can be very good to protect your privacy, more important is it to keep the information on your location and moving safely avoid strangers.